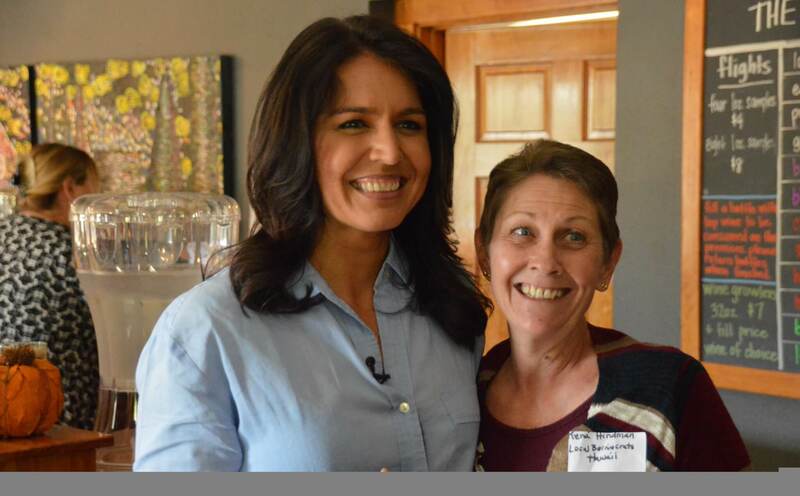 Hawaii Congresswoman Tulsi Gabbard keynoted Democratic barbecues this Sunday in Ames and Iowa City, hitting themes of party unity, love and anti-war in well-received speeches. 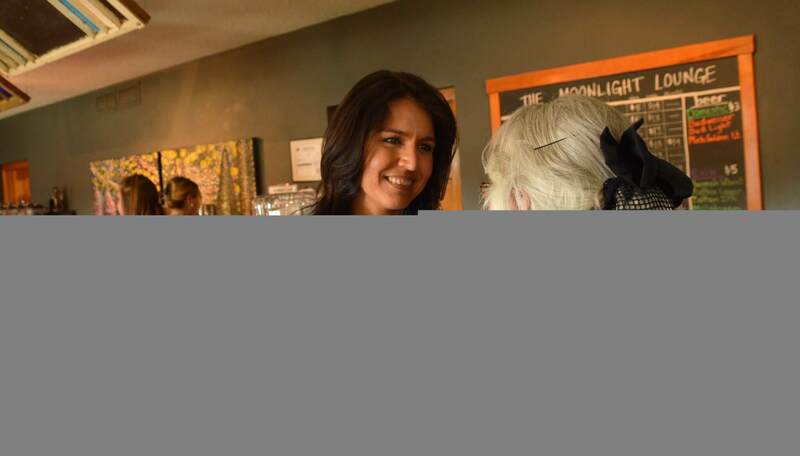 Gabbard has visited Iowa before for local party events in 2015 and 2016, but has not come to the caucus state nearly as often as other well-known Democrats and rising stars have. She noted that her trip this weekend was thanks to a “very patient and persistent” former Bernie Sanders activist that invited her to the Ames event. Gabbard began her speech with describing the “Aloha spirit” and how its idea of interconnectedness applies to political action today. She related that to a need to end the nastiness in political discourse, especially in the age of Donald Trump. She wasn’t just talking about anger directed at Trump and Republicans, however. 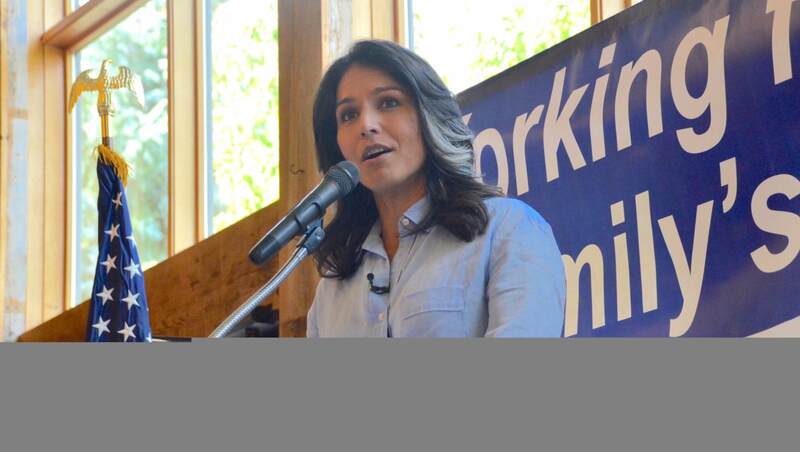 Gabbard made a point to encourage Democrats to cool down the intra-party warfare that still wages on from the 2016 presidential primary. Gabbard was one of Bernie Sanders’ most prominent endorsers during the Democratic presidential primary, gaining her many fans around the country. And she emphasized on Sunday many of the policies that Sanders often spoke about, including reinstating the Glass-Steagall Act, regulating Wall Street banks, criticizing private prisons, fixing the opioid crisis and combatting big pharmaceutical companies in the healthcare debate. But Gabbard also has her fair share of detractors in the party, including activists on all sides of the party’s ideological spectrum. Her past stances on gay marriage and Islam have garnered suspicion over her progressive credentials, and many questioned her judgement when she met with Syrian dictator Bashar al-Assad. That dissent, however, wasn’t evident in the room full of Central Iowa Democrats as Gabbard got two standing ovations and the most positive reception of the day’s speakers, which included all the gubernatorial candidates, 4th Congressional District contenders and 2020 presidential candidate Congressman John Delaney. The Ames and Iowa City events were part of a multi-day Iowa trip for Gabbard, who also met with medical cannabis activists in Des Moines. She related to the crowd her conversation with the parents of an epileptic child that were advocating for cannabis oil legalization. 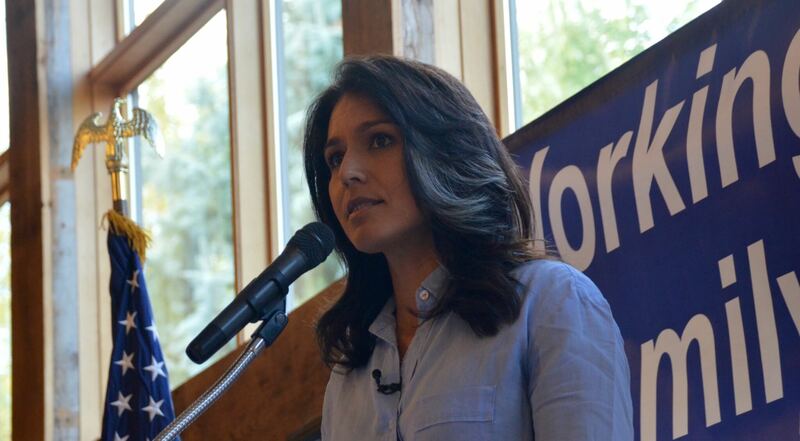 Gabbard called for descheduling marijuana from the list of federal controlled substances. “It’s a critical step as we talk about reforming our criminal justice system and ending a failed war on drugs, a war that incarcerates people for the use of quote-unquote illegal drugs while these prescription drug dealers of so-called legal drugs make billions of dollars of profit,” she said. The rest of Gabbard’s speech focused on war and peace, an area where she’s stood out in the Democratic Party. “It’s important that we remember who pays the price in these wars,” she noted, telling a story about her time in Iraq with the Hawaii National Guard where she would check the casualty list each morning to see if any Hawaiians had been killed or injured. She also reminded the audience that every one of them were paying a price for “interventionist, regime-change wars,” whether or not they were in the military service, arguing that America can’t pay both for wars and needed domestic programs. On the topic of North Korea, Gabbard described how American intervention with Saddam Hussein and Muammar Gaddafi helped lead to the Kim Jong Un’s resistance on his own nuclear weapons. Gabbard closed out her 20-minute speech in Ames by imploring Democrats to heed her Aloha message and conduct their political activism with a mind focused on love. That framing in particular offered up an interesting contrast to the style of the man she endorsed (who she resigned her DNC vice chair post for) from the 2016 primary. Rather than tick off statistic and study in rapid succession like Sanders often did on the stump, Gabbard wove in personal stories from her own life and her state to make her points. And her delivery was a much more understated, compassionate-sounding one than used by the loud and boisterous Vermont senator. Both approaches seem to work, as the crowd in Ames enjoyed her speech and well-wishers lined up afterward to get selfies with Gabbard. Tulsi Gabbard is a breath of fresh air. I was one of those that had a very difficult time voting last election and I do not believe that I was the only one. I believe that Hillary Clinton to be a worthy person to be President and no way would I ever vote for a person like Trump, so I had no choice but to vote for Hillary . The problem that I had with Hillary was the reports that she was chosen as the The person to run against Trump by the DNC and the DNC refusing to say that she was not the DNC’s (In House)chosen one which to my knowledge, was recently reported in the news media that the DNC admitted in Court that The DNC has the right to appoint anyone they wish. I Find that very repulsive and against every fiber of what Democracy stands for. I felt that The DNC made it a contest between the lesser of two evils. One would expect such behaviour from the Republicans. The Democrats need to be better than that and those doubts will always remain for many people until the DNC changes and publishes new rules, and maintains fair and honest elections. America deserves no less. True or not, it’s that type of comment that cost Clinton the election. DNC didn’t choose Hillary, millions of voters did. Specifically, her winning margin was provided by black and brown voters. For some reason, the Sanders cult thinks those voters don’t count. The DNC didn’t force them to pick Hillary, they chose her because she has worked hard to build and maintain relationships in the black community starting with going down to help end school segregation in the 70s. I find it repulsive that Sanders supporters are still referring to Hillary as a “lesser evil.” They sound like Republicans to me, smearing this smart, accomplished, compassionate, inspiring progressive woman. Fair and honest isn’t stealing vorer data: it was Bernie’s campaign that did that, not Hillary’s. In response, the DNC didn’t kick Bernie out, they merely sent some irritated internal emails about his selfish, vituperative, entitled campaign. Internal emails Bernie stayed in the race helping Trump by bashing Hillary and the party long after he was mathematically eliminated, as if he was entitled to the nomination. Bernie got more positive press as Hillary was trashed by the media, benefitted from undemocratic caucuses, appeared on the Sunday shows more than anyone, outraised Hillary and outspent while she refused to viciously attack him. He still lost because he couldn’t connect with anyone but entitled white kids, out of touch academics, and washed-up hippies. White men on the left need to accept that they cannot always have they’re way, stop trashing the Democratic Party, and grow up. Donna Brazile has confessed, in her own words, that she passed debate questions to Hillary to give her an advantage. Are you saying that Donna Brazile, a black woman, is a liar? Why are you silencing the voice of a woman of color? My millenial friends who supported Bernie Sanders and dislike Hillary and the primaries were rigged represent a broad and diverse group of women and POC. Why do you silence their voices? I had no idea that an Indian-American like me or my Chinese-Malaysian girlfriend were both white men. Thanks for clearing that up with me! Statistically, millenial women voted overwhelmingly in favor of Sanders over Clinton. Clinton’s victory was due to the over-45 crowd, the ones who still rely on mainstream media for news. Oh please. As an African American woman, I had to deal with this erasure of women and POC all through last year. You’re unable to argue against any of Bernie’s policies, so you have to resort to calling his supporters racist and sexist. You can’t argue against the overwhelming evidence of electoral fraud so you have to resort to calling the people who point it out as all angry white men. It’s gross, and it makes a mockery of real racial and gender issues that women and POC face. It’s crying wolf. I stand beside Nina Turner, Tulsi Gabbard, Susan Sarandon, Linda Sarsour, the organizerss of the women’s march convention, Rosario Dawson, and millions and millions of others in supporting a politician who champions equality issues.